More coming soon! Would you like to send us your personal story? My beautiful daughter Amy was born in May 2009, I hadn’t known what to expect and had no pregnant peers or experience with babies and pregnancy to know that anything was wrong. She didn’t cry, she didn’t wake for longer than 10 minutes at a time, she didn’t suckle, and she couldn’t hold her head up. They kept us in SCBU at Hawke’s Bay Hospital, yet with nothing to compare her to I didn’t think to worry. 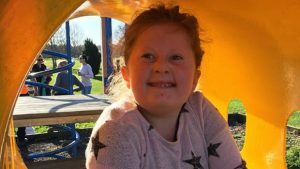 She was diagnosed with Prader-Willi Syndrome at 11 days old. My world, already so different to plan, took another sharp turn. I grieved the idea of the baby I’d lost; my baby who would be a mini-me, a singer, a performer, an academic achiever, the baby who would be a better version of myself. I was given internet print-outs detailing all the horrific aspects of my precious baby’s condition. She would be morbidly obese. She would have an uncontrollable appetite. She would have social and behavioural issues and struggle to make friends. She would be well behind her peers mentally and academically. She may not develop speech. She will have a much shortened life expectancy. She will not be able to have her own children. She will pick her skin uncontrollably. She will have dysmorphic features. I no longer saw my strawberry haired baby with her pixie features, but all the horrible things that she would one day be. Her first year was marked by an ironic struggle to get her to eat and gain weight. I expressed milk for six months to bottle feed as she couldn’t suckle, feeling like I owed her every tiny advantage I could give her. I withdrew from the world, my friends, and even my family. I didn’t know what I was feeling at the time, I now identify it as depression. I didn’t know how to deal with both having derailed my future and also having a baby who was different. I couldn’t relate to people who did have babies. They were generally older, and their children were achieving their milestones while my daughter wouldn’t crawl until 22 months. They had Plunket nurse visits while I had paediatric appointments and lessons in replacing her nasal-gastric tube. I didn’t know how to fit my baby into the narratives they all shared. When Amy was 9 months old I went back to finish my degree in Wellington. This marked a sense of regaining my identity and control of my own future, but also the moment I began to see that my daughter’s condition didn’t define her. She started to develop her own personality, she had a sense of humour and mischief in her eyes. She picked up baby Makaton (sign language) through the wonderful service Wellington Early Intervention Trust (WEIT). When she signed ‘sad’ to me when we saw another baby crying in the supermarket, I first saw the compassion and empathy she had for others. She loved walking with her walking frame, she loved her music therapy sessions, she loved meeting other children – her eyes held fascination and an ability and eagerness to learn that wasn’t defined by a diagnosis. I ended up waiting until she was 6 to enrol her in school as I hadn’t found a suitable one. I had sleepless nights and was breaking out in a full body rash at one point over the sheer stress of the prospect of sending her somewhere she would be thought of as a nuisance. We finally found a little country school who rescued us. The first question the principal asked me was “so what would you need from us to make sure Amy was safe here?”. It took everything I had not to cry at that moment. It’s been the best fit I could have hoped for her. Through my daughter’s life, we have come across some amazing, caring, passionate people. At 8, we are only really beginning Amy’s journey. Being her expert and advocate alongside the normal challenges of single parenthood and trying to have a career and my own life is an ongoing juggling act. Amy is my life’s biggest challenge and, as is often the case, the biggest reward. She loves so completely, if you’ve ever been a friend to her then you’re a friend forever. She has a car game where she lists all the people she loves and who love her – and it’s a long list. She has a special bond with her grandparents on both sides, as they’ve been leant on heavily due to our age when we had her. She makes me value people more, I’ve been exposed to so much compassion and empathy and selflessness from people who decided to care about her when it’s not their job. At every stage of her life I’ve met people who go above and beyond, trying to make up for the gaps in our support systems for our special needs children.